The ESCAP Asia Pacific Information Superhighway (AP-IS) steering committee meeting, this past August in Bangkok, heard us present the need for an inventory of E-Resilience tools. 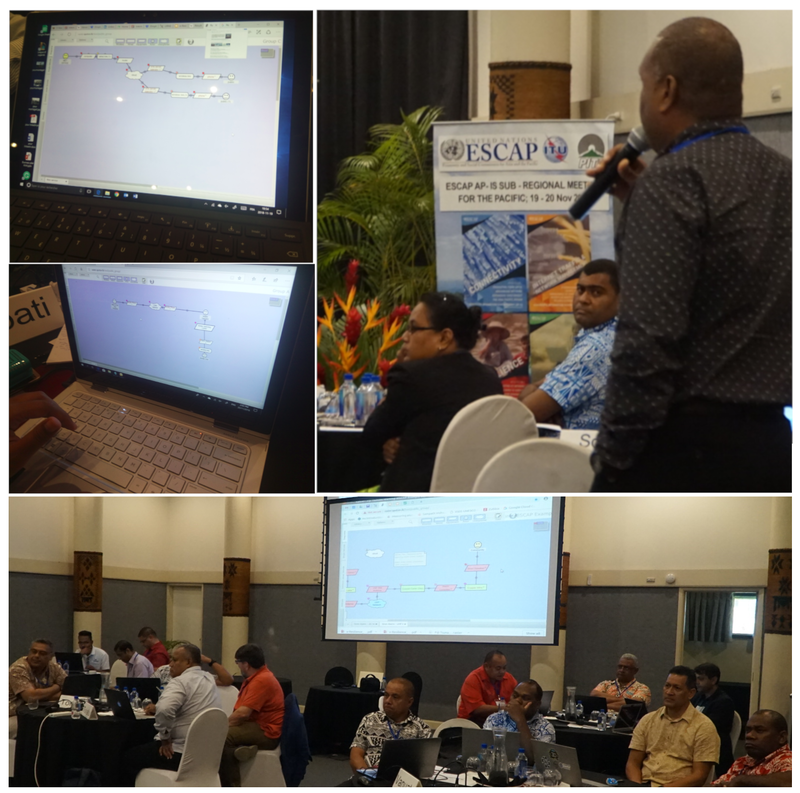 Among the list of recommended concepts was the Risk Assessment and Step-wise Refinement (RASTER) methodology; one that caught ESCAP's attention. The tool and its participatory approach reveals "black swans", in telecommunications, to then derive policies and procedures for mitigating those low frequency high impact vulnerabilities. Sharing participant experiences of telecom outages during disasters. All three activities converged on realizing and understanding how to use simple tools in achieving E-Resilience. For part of the RASTER Exercise, we used a real world case of the updated Suva-Fiji Tsunami siren warning system. The diagram shows the UHF-based siren triggering system and the respective RASTER analysis. Through the RASTER exercises, the participants found that signal weakness, physical damage to hardware & wires, and stable main-grid and adequate battery power were the significant shortcomings. It is important that E-Resilience consider a systems approach; where power systems, for example, are imperative. It requires considering all stakeholders and dependencies as well. Moreover, investigating the damage, congestion, and jamming type factors affecting single and common component failures. The participants trialed the questionnaire designed to assist in realizing the business continuity readiness. One would typically exercise this questionnaire with the depended Telecos or their own institutions, for example. The "cloud" component, in RASTER, is used when there's ambiguity of the the actual internal system mechanics of a system. It could be a UHF relay network, as in the example of remotely triggering the siren towers. The business contingency readiness questionnaire becomes resourceful in understanding the reliability of this cloud service and prevailing Black Swans. Samoa and Solomon Islands claim to have well established BCP requirements with trained personnel, institutionalized procedures, and having identified all communication priorities and components. All other member state institutions have management procedures; but the they fall short in implementing the necessary elements for making their communication resilient. Only Solomon Islands, Tonga, and Tuvalu have established mechanisms to be aware of threats and relay those to the response teams for activating any kind of response procedures. The others either have partial or no mechanism to alert of events or threats. The evidence of their readiness can be matched with the Participant stories - 2015 Cyclone Pam was a common experience and a point of reference, for most of them. The category 5 cyclone plowed through Vanuatu, with 200km/h winds, damaging all their telecoms. It also affected their neighbours. Although the cyclone path maps show it to die north of Vanuatu, the effects reached as far as the southern outer islands of Kiribati, close to Tuvalu. The strong tsunami like waves damaged their only Speedcast VSAT link but now replaced with a Kasific link. Most outer islands, of all Pacific Islands, are shy of 3GPP-based internet. The small populations makes it difficult for the Islands to build a lucrative business case to lure investors. The economic struggles, Small Island Developing States face, makes it difficult for them to subsidize the role out. To compensate, VHF radios are the only mode to stay connected with Island Councils. How progressive is your organization? Today's world requires organizations to be at the top of their game! Real-Time business intelligence is one of the most vital aspects in staying ahead. Competitive markets forces you in keeping cost and wasted resources down. Spot-On's end-to-end automation from data gather, statistical analytics, dissemination, and reporting technologies are designed to, relatively, minimize your costs and maximize your benefits.